The centenary of the birth of Ernest Bevin is being used to tell us how great was the contribution he made to the welfare of the working class and indeed, the whole British people. 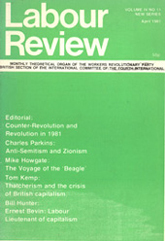 According to Peter Batty, who was responsible for the ITV documentary on Bevin’s life, and gave us a blurb in the Observer colour supplement, Bevin was a colossus, creator of Britain’s biggest union and a superman of the West who ‘more than anyone else, united the free world against Stalinism’. It is not without significance that two of Mr Batty’s authorities on Bevin are Mr Roy Jenkins and Lord George Brown, well known renegades from the labour movement, the former having been joined in the Council of Social Democracy by his biographer Alan Bullock. With what regret must they conjure up the ghost d the strong man of the British trade union bureaucracy, loyal servant of British imperialism and staunch defender of the most anti-socialist policies of the British-American alliance. For it is not just Bevin who has passed, it is a whole period of the British labour movement. That is why the social democratic gang was isolated in the Labour Party and trade unions. They have to be content with a ghost from the past because no trade union leader today dare follow them, let alone attempt to take his union to them, whatever his sympathy for these renegades. The two decades after the war have gone. Then the Bevin-Attlee or Gaitskell-Deakin alliance of right wing parliamentarians and trade union bureaucrats ruled the Labour Party. The power of that trade union bureaucracy was consolidated during a period of working class defeats before the war. New generations of combative and confident workers, in a world of revolutionary change since, have shaken the foundations of that bureaucracy. A great deal of nonsense is being spoken and written about Bevin the man, separated from the social forces in which he lived. Bevin came up as a national leader of the trade unions out of the upsurge of the working class in a great wave of industrial struggles that swept Britain before the First World War. He went through the tough industrial struggles of organising dockers, carters and casual workers in the West Country and South Wales. Capitalism had entered its decline. The explosion of the lower depths of the working class into trade union organisation shattered the caste of corrupt, conservative trade union officials which had hardened during the vast capitalist expansion of the latter half of the previous century. Syndicalist ideas were rife. The wave of struggle collided with the opportunist leaders of the newly formed Labour Party who sought to tie it to the Liberals. The feeling for ‘direct action’ was diffused among the rank and file. Tom Mann, James Connolly, Jim Lark in and others propagandised the conception of the socialist society being brought about by ‘direct action’ and built on industrial unionism. The best of the young rank and file leaders of this time later broke through their syndicalism and fought for a communist party. Bevin was not among them. Bevin spent a little time with the Social Democratic Federation — a socialist propagandist organisation. Although an indefatigable organiser of workers into the union and in struggle he was dearly no revolutionary. He supported ‘direct action’ but within the confines of pure and simple trade unionism — to get the recognition of the working class in society on an equal plane with the middle and capitalist class. Trade union membership doubled between 1913 and 1920. As the unions grew in power Bevin began to identify recognition for himself and the bureaucracy as recognition for the working class. Bevin was an empiricist to the core. He hardly ever read a book. In these early years he, at times, expressed the strength of an upsurge of the working class but within the limits set by capitalist society. In 1920 he threatened national industrial action against war with Russia. But it was action to put on pressure. His demands echoed the old Liberal foreign policy of non-interference, while the rank and file of the labour movement were moved by international class solidarity with the Russian Revolution. His union joined the Triple Alliance of miners, transport workers and railwaymen and he voted on the betrayal of ‘Black Friday’ in 1921. He and other leaders called off a Triple Alliance strike in support of the miners because the power of workers’ organisations was posed against the power of the capitalist state. ‘Bevin himself looked on “Direct Action” as a form of pressure on the Government rather than a prelude to revolution’ writes Bullock. The final reckoning for united action as a ‘threat’ or ‘pressure’ was in 1926. The Government refused to budge before the TUC who wanted negotiations to win some small concessions on the slashing cuts demanded from the miners. The Government broke off discussions and the TUC was left with no alternative but to carry out a threat of a General Strike in support of the locked-out miners. The ruling class, with Churchill in the van, fought to defeat a revolution. Bevin and the General Council sought desperately to contain the power of the working class and find a road to capitulation. — his aim on the Organisation Committee of the General Council was ‘to try to get such a powerful body of people — commercial, religious and otherwise — to appoint a committee which would have acted as a mediatory committee between us and the Government’. Bevin was part of the treacherous capitulation which ended the strike and left the miners to fight alone for another six months. Within a year later union membership had fallen by Haifa million. The working class suffered the results of the 1926 defeat in victimisations, and slashing attacks on wages and conditions. They went through the crisis, slump and mass unemployment of the l930s. Trade union membership in 1934 was half of what it had been ten years previously. Bevin and the trade union bureaucracy clamped themselves more firmly on the working class. Bevin was in the vanguard of tying the unions to the employers and the state. Such a man, tough, ruthless, with no socialist principles, one who had already shown his ability in dealing with rank and file opposition in his own union, was the very one needed when the Labour leaders rallied to the assistance of British capitalism in 1940. Only by using the labour and trade union leaders who could exploit the workers’ widespread hatred of fascism as the destroyer of working class organisation, could the British ruling class secure the necessary war effort. So Bevin was given the job of introducing control of labour and conscription of women to industry, including nurses up to 60 years of age and cotton operatives up to 55. Women were compulsorily transferred from one end of the country to the other; workers were forbidden to leave their jobs; workers were imprisoned for absenteeism or striking. At one time Bevin made an order that boys of 16-18 could be ordered from the pit head to work down the mine. Against widespread opposition in mining areas he introduced his ‘Bevin boy’ scheme by which apprentices and other youth were conscripted to mining work. In 1944 unofficial strikes of miners spread until a quarter of a million miners were out. There were a number of engineering and other strikes. To suppress the discontent Bevin wanted to introduce a Regulation with severe penalties for ‘incitement’ to strike. To set the atmosphere for it there was an orchestrated witch hunt in the press against the Trotskyists. They were accused of being the ‘hidden hands’ behind the strikes. In preparation for a widespread attack on the rights of all workers the rights of revolutionaries were first attacked. Trotskyists were arrested under the Trades Disputes Act of 1927, accused of conspiring to bring about the apprentices strike against conscription into the mines. The Trades Dispute Act had been passed as a punitive measure against workers’ action after the 1926 strike. Bevin and other leaders of the trade unions and Labour Party were pledged to fight for its repeal! Regulation 1AA, which Bevin now pushed through, meant that anyone found guilty of ‘declaring’, ‘instigating’ or ‘inciting’ any other person to take part in a strike in ‘essential’ services, could be sentenced to penal servitude for up to five years or fined up to £500— or both. The Regulation met all round opposition among trade unionists. When the Regulation came before the House of Commons, only 56 out of 165 Labour MPs voted for it. Twenty-three voted against and the rest either abstained or were absent. The Parliamentary Labour Party refused Bevin’s demand that Aneurin Bevan should be expelled for opposing Regulation 1AA. In the closing stages of the war Bevin supported completely the attempts of British imperialism to establish the old pre-war corrupt, dictatorial and imperialist regimes in Europe and Asia. He played his most despicable role in assisting Churchill and the British ruling class in Greece. The Greek organisation EAM — a coalition of seven parties including the Liberals and the Communist Party — had the mass support of Greek workers and peasants. ELAS, its military organisation, was the main resistance to the German occupation. The mass of the people were opposed to the return of the monarchy and the pre-war dictatorship. Eighty-five per cent of the Greek army had been interned by the British in Egypt because of its support for EAM. British capitalism was determined to re-impose the rule of Greek landowners and capitalists under King George of the Hellenes. The British Military Government demanded the disarming of ELAS. Workers and peasants refused to give up their weapons while royalist officers retained their arms. In Athens on December 3rd 1944 there was a peaceful demonstration in support if EAM and in protest at royalist demonstrations in the previous days. The demonstration was led by women and children. British troops fired into the head of the march and killed 15 and wounded 148. A General Strike broke out throughout Athens. In Britain, the rank and file of the trade union movement reacted with anger. Civil war began in Greece. A section of Ghurka troops in the British army deserted to ELAS. The Observer prophesied ‘serious labour trouble’ and said that even if victory over ELAS was won it ‘might break the coalition’. Bevin and other labour bureaucrats worked might and main to prevent a condemnation of the coalition government being passed at the special Labour Party conference which was to be held later in December. To avoid the danger of the party conference passing a direct vote of censure on the Government and its labour members, the NEC put forward a resolution calling for an armistice, without delay and the resumption of talks to establish a Provisional National Government in Greece. Bevin lined up the block votes to carry the resolution and Bullock remarks that Churchill never forgot the debt he owed Bevin for this. The Soviet bureaucracy pressurised the Greek Communist Party to accept an armistice. Churchill had visited Moscow the previous October and got the assurance from Stalin that Greece would be in Britain’s sphere of influence. Fifty thousand British troops remained in Greece. Workers and peasants were disarmed. By 1947 there were 14,000 Greek political prisoners living on the penal islands, half starved, without sufficient fuel, bedding and water. Court martials were working continuously, sentencing to death civilians as well as soldiers. It was Bevin’s ‘belief that foreign and defence policy, unlike domestic policy, should not be a matter for party politics’ wrote Bullock in The Observer of March 8th in an article on Bevin. Bevin clearly put the imperialist content of this belief at the special Labour Party conference of 1944, when he supported the repression in Greece. It was the rapidly growing hostility to capitalist policies that ejected Bevin and the other labour leaders out of the War Cabinet. Eden, in his memoirs, reports a conversation with Bevin in June 1944 about continuing the coalition in the immediate post war period. The growing opposition to the political truce and to foreign and domestic policy of the Government and the massive desire for a change made it impossible for Bevin to fight for his plan of a continuation of the coalition. We find here that the ‘tough’ trade union leader who, we are told, was a champion of ‘his people’, has a deep and essential servility to the rulers of society and their institutions. The Jimmy Thomases and the Ernie Bevins love to drop an aitch in front of the monarch — but as one of his most loyal, hand-kissing subjects. The same loyalty and attention, of course, is not given to their trade union members. It would be quite against British tradition and constitution for workers to expect their representatives to treat them like they treat the rich, unelected monarch, and tell them ‘everything that is going on’ in the Government! For a decade after the war ‘Bevinism’ was a dirty word in the British labour movement. Bevin was the arch defender of the interests of British imperialism and the alliance with America’s rulers. He was one of the leading protagonists of the cold war. Bevin is reported to have said during the war that he wanted to see a ‘Peoples’ Peace’. But what sort of peace did he and the labour leaders fight for? With their help and that of the Stalinists in Europe the revolutionary wave after the war was defeated, workers and peasants disarmed and the old capitalist rulers firmly re-established. With those betrayals the choice of socialism or barbarism gained a new dimension — for the capitalism they saved now developed nuclear weapons. Bevin and Co. saw their task at the end of the war to maintain the basic capitalist imperialist relations existing in Britain and the Empire at the beginning of the war. Any role for the ‘peoples’ interests’ in the peace came about when imperialism was forced to retreat before the strength in struggle of the colonial people and the working class. ‘Ernest Bevin both developed and exercised power on behalf of ordinary working people for a long time.’ The truth is that Ernest Bevin exercised poor which came from the working class, but he exercised it on behalf of the capitalist class. That is the meaning of what Bullock tells us when he writes that in the War Cabinet Bevin put ‘loyalty to the coalition before party interest, to the anger of not a few members of the Labour Party’. A new type of leader came up in the T&G in line with the times. The new leaders — Cousins, Jones and Moss Evans — adjusted to the situation with left talk. Moss Evans in his foreword to Mark Stephen’s book praises Bevin for ‘pioneering what today we might call “tripartism”, demanding and winning in later years a recognised role for the voice of the working people in the nation’s affairs’. The voice of the working people is expressed through its own power and its own organisation. Moss Evans is expressing the cry of the bureaucrat who wants to hear his voice in the councils of capitalism and take his turn in the NEDC. It is the cry of the ‘alternative strategist’ of the TUC who complain that ‘tripartism’ has broken down and call on the working class to protest that the Tory Government will not take them into partnership.